Emergency Preparedness is something that has to be talked about in advance; once disaster hits, most kids will be severely impacted by stress and may freeze up in the face of danger. 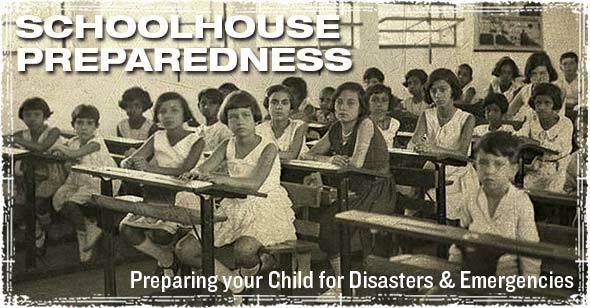 Preparing your child for disasters and threats means preparing them to face them without you, this is especially true if your child attends public school. When preparing your child to deal with possible threats they may face at school, you need to talk to them about each situation and then help them develop a plan to deal with that specific threat. Community violence that occurs near the school. Depending on the situation, a lot of schools will immediately go into lockdown mode –especially if violence erupts within the vicinity of the campus. Violent behavior. One of the biggest threats your child will face is the threat of violence from other students. Unfortunately, in today’s sick society they may also be exposed to violence from unbalanced teachers as well. That’s why it’s important to teach them the basics of self-defense, and let them know they always have the right to defend themselves from violence – no matter who is threatening them. School shootings. While the threat is still pretty rare, it is something that seems to be on the rise; so you need to talk to your child about what they should do when confronted with a threat of this nature. Terrorist threats. Terrorists have increasingly expressed interest in targeting public schools, so this is a threat that cannot be overlooked. Natural disasters. Tornadoes, floods, hurricanes, and earthquakes are all things that can hit at any time. Your child needs to have the tools in place to deal with these types of emergencies. As parents, we try to prepare or kids for the many dangers they will face throughout their lives. It’s not always easy talking to your child about these types of situations, but doing so is the only way to ensure their ability to handle the threat. Teaching your child what to do in each situation can save their life, and the lives of others around them. Find out what plans the school has in place to deal with emergencies. The first step you need to take before talking to your child, especially if your child’s school has conflicting policies, is to find out exactly what plans and procedures the school has in place for dealing with emergency situations. What is the schools evacuation plan? Where will the children be taken in the case of a disaster that makes it dangerous to remain inside the school? What is the schools lockdown policy? During certain types of disasters, most public schools now have mandatory lockdown policies. This is something you need to know and plan for, since many schools will not let your child out of the building, or let your inside during a lockdown. Keeping a copy of your child’s schedule will allow you to know exactly where they are in the school at all times of the day. If and when disaster strikes, you’ll know exactly where they are and can adjust your plans accordingly. Take the time to talk to your child about their schedule. Talk about what obstacles they might face, and help them decide what the quickest route to safety is from each class. Ask for a map of the school. This can help you determine the best evacuation routes from each of your child’s classes. Shelter in place can be deadly: Have an alternative plan. Because of all the recent school shootings, most schools now have a policy known as shelter in place. During an active shooter situation, your child’s school will go into lockdown mode and your child will be told to shelter in place. In my opinion these policies are asinine at best, and will probably be deadly during a real world school shooting. Only you can decide what your child should do during this situation, but my advice would be to immediately get as far away from the danger as possible. Sheltering in place makes your child a sitting duck, and as we’ve seen time and time again these policies are deadly. What are the schools pickup policies during emergencies? When disaster hits, your first instinct as a parent is going to be to rush towards the school and get your child. It sure as hell would be my first reaction, but then again I’m a strong proponent of home schooling, but we’ll leave that for a future article. From the schools perspective, the policy does make some sense since thousands of panicking parents rushing towards the disaster zone is going to create a logistical nightmare. That being said, you need to have a plan in place for dealing with the aftermath of a disaster that hits while your kids at school. Again, only you can decide what the right approach will be, but you must decide before hand and be ready to act. My childs school is on the back of a “closed” military base. During lock down several people were able to gain access to the school. Many of the teachers did not even know there was a lock down due to radio malfunction or shortage. We spoke to our child about protecting self in any situation. We have even done a walk through with our child. May seem paranoid but taking the panic out of things works for her. Hopefully she will never need the information but I would rather her have it and not need it. schools DO NOT want parents wearing their uniforms coming to get their kids. I am reading on the net. saying it is scareing students? that is crazy. are schools teaching (FEAR)of military? that’s the way I see it. telling a parent to change clothes, this is very wrong. what is your communication plan? Sometimes local phones are down but texting outside the area works. have them text an outside the area family member. Do you have a “safe” code word established with your children? Something you could tell a friend to use to let the kids know they are OK in case you can’t do the pick-up. Rally points or meet up places if something happens while they are away from school?